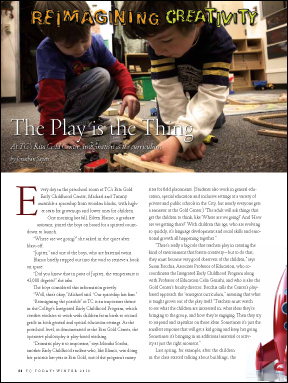 This is an article about TC’s Integrated Early Childhood Program. 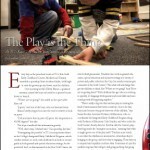 It appeared in the Winter 2010 issue of TC Today. Every day in the preschool room at TC’s Rita Gold Early Childhood Center, Michael and Timmy assemble a spaceship from wooden blocks, with higher seats for grownups and lower ones for children. One morning last fall, Eileen Blanco, a graduate assistant, joined the boys on board for a spirited count-down to launch. “Where are we going?” she asked in the quiet after blast-off. “Jupiter,” said one of the boys, who are fraternal twins. Blanco briefly stepped out into the void to retrieve a book on space. “Did you know that in parts of Jupiter, the temperature is 43,000 degrees?” she asks. The boys considered this information gravely. For more, please click Early Childhood.